Ski in and out is the way to go in Mammoth for first class vacations. Our luxury rentals in Mammoth sit right on the snow, or just to the side of the slopes. Go out your door, walk to the path and ski down to the chair lift. Now that's style! For an active nightlife, stay in or near the Village in exquisite properties that are perfect Mammoth rentals. 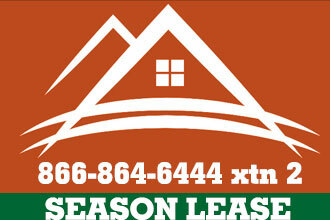 Mammoth Lodge offers 1 and 2 bedrooms in the village and 3 or 4 bed styles in adjacent townhome rentals. Having a walk to the lifts Mammoth Mountain vacation rentals is the most popular style of place to stay. With 100s of choices, these rentals come in all sizes and styles, and fit every budget. Luxury rentals can be found both on the Sierra Star course with homes and private residences for discriminating travelers. We offer over 185 beautifully appointed Snowcreek rentals all which include use of the Snowcreek health club. The Timbers are 4 bedroom homes just a short walk from the slopes and right across from the clubhouse. Large enough for 2 families to share. Sitting on the Sierra Star golf course, these 2 and 3 bedroom condos are ideal for winter or summer vacations. Modern aesthetics with a mountain twist. Made for family weekends, these 2 and 3 bedroom condo rentals in Mammoth are on the golf course, yet you can still walk to the slopes, or bus it to downtown and the village. For convenience to the golf greens, the slopes and downtown, these townhomes are first class rentals with many open living space features. An all time favorite, the townhomes and condos are truly ski in out. All with extraordinary views, features are community gym and spa right on the slopes.